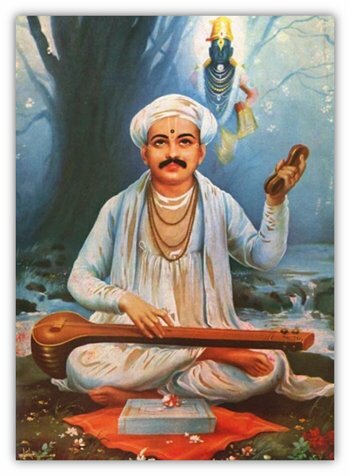 Children, Sant Tukaram Maharaj had immense faith in God. That is why, he was able to sacrifice everything very casually. After realising the greatness of Tukaram Maharaj, people started to respect him. Then, he started going to the forest for solitude and meditation. Once, Tukaram Maharaj did not return home for two months. One morning, when his wife was going home after taking water from the river, she met Tukaram on the way. She angrily told him, “You don’t come home. What shall we do? From where do we get our daily needs?” Tukaram replied, “Deity Pandurang is my father and Deity Rukmini is my mother. You too surrender yourself at their Holy feet, they will provide you with food and clothing. On this, his wife said, “I shall chant the Name of God everyday; but you please stay at home.” Tukaram said, “If you promise me this, then I am ready to stay at home.” She promised him that she would chant the Name of God regularly and they both came home. It was Ekadashi. (The eleventh day of the waxing or the waning moon; considered as a sacred day). Tukaram Maharaj sat next to the Holy tulsi (basil) plant and gave guidance to his wife about Spirituality. His wife was inspired by this guidance. Next day, she woke up early, had a bath at sunrise, did puja (ritualistic worship) of God and donated everything that was in the house to Brahmins. Later on, in the afternoon, there was no food left in the house. She fell into deep thought. As she had fasted the previous day because of Ekadashi, she was very hungry. Deity Rukmini decided to test Tukaram Maharaj in this adverse conditions. She took the form of a queen and came to test Tukaram. She came to Tukaram’s house and said, “I heard that you have given away everything to Brahmins; if there is anything left, kindly give it to me.” Tukaram Maharaj gave away a saree that was hanging on the rope to her. Tukaram’s wife was annoyed on seeing this. She said to herself, “Just yesterday, I brought him back home after two long months. Just see how he misguided me and made me give away everything we had to the Brahmins. The kids are so hungry!” She was so angry that she went out to pick up a stone. She had decided to go to the temple and break the feet of the idol of Deity Pandurang with that stone, as she believed that it was because of the worship of those feet that she and her kids had to bear these hardships . When she told Tukaram Maharaj about her intentions, he said to her, “You should rather break my head with this stone.” However, she walked towards the temple. Tukaram Maharaj followed her. As soon as she entered the temple, Deity Rukmini closed the door of the temple. Tukaram Maharaj was left outside. Just as Tukaram’s wife was about to break the idol with the stone, Deity Rukmini caught her hand and asked her the reason for doing this. Tukaram’s wife replied, “My kids are crying because of hunger; they are restless. These Feet of Shri Pandurang have betrayed us. Hence, I am angry and want to break them .” Rukmini said calmly, “Relax! I shall provide you with everything you need to sustain your family.” Then, Rukmini gave her a saree, blouse and some gold coins and pacified her. Tukaram’s wife was glad with this. She bowed down and touched Rukmini’s feet and went home happily. Tukaram Maharaj was sad to see that inspite of giving her guidance on the importance of sacrifice, his wife brought gold coins from Rukmini. He told her, “You have lost Paramartha (life’s highest objective) . God can only be Realised by sacrificing superhuman power and wealth .” Thereafter, Tukaram Mahraj took the gold coins from her and gave them away to poor people. Children, only if we have firm faith in God we can practise this virtue of sacrifice. Everything that we have is because of God’s grace. However, since we lack devotion towards God, we fail to understand this. For that, it is necessary to regularly chant the Name of God.